· [Treble attitude] - with a powerful Height attitude function can solve the gas lever and will be the drone at a height of float. To hoche qualitäte make photos and videos. 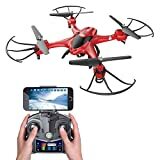 · [Mobile control] - control the drone with an APP of your Smart Phone, multi-function, for example: Gravity sensor to Trampoline. From the application interface controls the camera function and fly. · [headless mode and one key return function] - with headless mode simplifies control; One key return function: to avoid disorientation of the drone. Please make sure they are in all horizontal with drone. · [best customer service] - please contact us, if you have problems or questions during flight. we will offer you the best customer service and give a satisfactory answer. I was surprised how well it worked and its features for the price. It has a great camera installed on it and I got some really cool aerial photos and videos of my place. This thing is almost indestructible. It fly´s very easy.